Take a rooster—and maybe a milk cow while you’re at it—into Judith Racht’s home in Niles, Mich., and the animals would likely agree it looks nothing like a barn. While the concrete grain silo is a giveaway to the structure’s former life, the sleek, modern interior looks more like an urban loft space than a place where animals might have once slept. Ms. Racht, a 64-year-old art-gallery owner, used to live in a proper house on the 62-acre farm. But in 2010, she razed the house and moved into the antebellum barn. “You went in there and you just felt like you were in church,” she says. A two-year renovation transformed the interior of the 4,200-square-foot home, which now features contemporary furnishings, modern-art pieces and an open-concept kitchen with stainless-steel cabinetry. The home has two bedrooms and four bathrooms, with a workout room and 57-foot-long lap pool in the basement. Many old wooden barns dotting the landscape don’t see much agricultural use anymore. But these structures are proving to be surprisingly compliant with current tastes, offering ample square footage and open-concept design in remote locales with plenty of privacy. The result: Instead of tearing them down, deep-pocketed homeowners are making hay while the sun shines, turning them into spacious, modern residences. 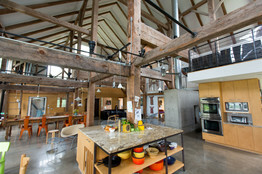 The inside of Arnold and Elise Simon Goodman’s barn in Pine Plains, N.Y., could be mistaken for a New York City warehouse conversion. The posts, beams and trusses—all joined with wooden pegs—frame a space with polished concrete floors, a leather sofa and glass tables. The Goodmans, whose main residence is on Manhattan’s Upper West Side, caught the barn bug over a decade ago. In 2001, they paid $35,000 to buy a barn located west of Albany, N.Y., and have it moved to their 150-acre property in Pine Plains. In late 2003, while the barn was being converted into their vacation home, they paid about $15,000 for two smaller barns, these from south of Albany, that are now used as a garage and storage shed next to their 1-acre pond. 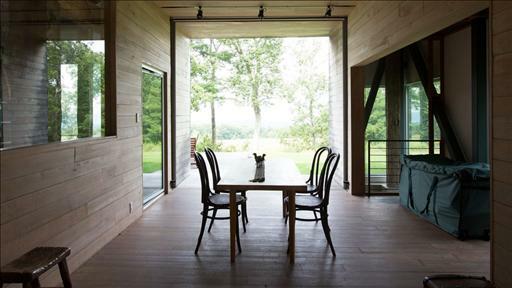 The couple’s latest project is a barn from Great Barrington, Mass., that was disassembled so it could be converted into a two-bedroom guesthouse on their Pine Plains property. While Mr. Goodman declined to disclose spending totals, the guesthouse is budgeted at $175,000, he says. Barn projects vary widely in expense and complexity. Sometimes the structures stay put and get a top-to-bottom makeover with modern heating and cooling systems, and other updates for full-time living. Increasingly, however, homeowners are having the barns disassembled and either moved to a new site or used as parts for new construction. Heritage Restorations, a Waco, Texas, company that turns old barns into homes, has seen business increase steadily over the past 15 years—even during the housing downturn, says Kevin Durkin, the company’s 59-year-old founder. 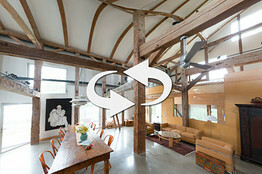 Mr. Durkin has built barn homes in 25 states and for clients in Japan, New Zealand and Australia. Projects range from a simple 1840s barn transformed into a loft home, to a complicated 1780s-barn turned into a mountain ski home with multiple floors and dormer windows. To find barns for home conversions, Mr. Durkin posts signs and advertises in newspapers throughout upstate New York. After the purchase, the barns are disassembled and put into storage; the structure’s specs and renderings are cataloged for future homeowners to browse. Most of his clients buy the wood frames, which he fumigates for insects, and have them relocated to their building site. His staff includes architects, contractors and craftsmen who do everything from recreating barn doors to designing furniture. The typical project takes about a year, and Mr. Durkin usually has 25 going at once—so he spends a lot of time on the road. Prices for completed projects have ranged from $200,000 to $5 million. Mr. Durkin is currently completing a barn conversion in Millbrook, N.Y., where two structures—one from the 1820s and the other from the 1860s—are being turned into a country retreat. The barns, both found near Albany, retain most of their original hand-hewn hemlock structural elements. Mr. Durkin estimates the project, which has taken two years, will cost $2 million. Details of the four-bedroom home include ornate claw-foot tubs, a 35-foot-tall stone fireplace and reclaimed wood floors. Other barn enthusiasts say that many structures are being lost to neglect, development and insects. Some owners even give their barns away to rid themselves of both a potential safety hazard and a tax burden. “The first choice is to try to use them as close to the original purpose, but I would rather see them as homes than as kindling or in a landfill,” says Jeffrey Marshall, president of the Heritage Conservancy, a not-for-profit preservation organization. As a real-estate investment, there’s no guarantee the barn conversions will increase in value or sell quickly. When Lei Barry listed an 1890s converted barn in Horsham, Pa., three years ago, she thought it would command around the $3.9 million asking price within a year. But, after multiple price cuts—including more than $100,000 in late August—it remains on the market as a short sale for $1.2 million. She says she has taken hundreds of calls, but the 10-acre suburban site off a busy road can’t be subdivided or used for anything else. “The listing has been a challenge,” says Ms. Barry, a real-estate agent with Keller Williams Real Estate in Blue Bell, Pa.
Because such abodes are uncommon, barn homes can generate buzz when listed for sale. “There’s a certain elegance that can come along with these properties that is very hard to capture with a more recently built home,” says Chris Masiello, who grew up in a converted barn and is now chief executive of Better Homes and Gardens Real Estate the Masiello Group in Keene, N.H. Still, these homes aren’t for everyone. They tend to be located in remote areas or on larger pieces of land. Many have soaring spaces that can be pricey to heat and cool. They often have lofts and floor plans that might not appeal to families with children. Buyers are “accustomed to more traditional room arrangements,” says Norman Callaway, managing member of Callaway Henderson Sotheby’s International Realty in Princeton, N.J., who is marketing a $4.4 million converted barn on 17 acres in Hopewell Township, N.J.
Last year, house hunters Alan Wiener and Patti Liberman fell in love with the Tulane Barn in Princeton, N.J. After spending 16 years in a traditional side-hall colonial, they were excited about living in a former dairy and hay barn that had undergone an “exquisite” restoration, says Ms. Liberman, an attorney. The stately five-bedroom home, which they bought for $1.75 million, includes the historic timbers as well as modern touches, such as a kitchen for entertaining and a spa-style bath. The backyard includes a grassy ramp left over from the barn’s working days. Ms. Liberman, who doesn’t mind the sloped yard, loves that the year “1876” is carved into one of the beams. “We don’t know if it’s authentic, but we think having a bit of history is really exciting,” she says. OAuthException: Error validating access token: Session has expired on Thursday, 12-Jan-17 10:26:33 PST. The current time is Sunday, 21-Apr-19 12:00:56 PDT.